Good whisky. Good company. Nowhere better to be. All the hallmarks of a brilliant night. We had already organised one excellent evening for the Whisky Appreciation and Nosing Collective (the acronym formed is indeed apt) so another was bound to happen. And although it was held up by the final participant being slightly behind schedule (three hours behind schedule, no less) the night was a rousing success. All members contributed a bottle (or several) to be sampled throughout the night, and we managed an interesting balance of single malts and blends, from Scotland, Tasmania, and even our first foray into Irish whiskey. All were enjoyed by the group, but some more so than others. Coming from Tasmania, we of course loved the Lark standard release (we had long since polished off the Distillers Edition, sadly), but the revelation was our first sample of another rapidly-rising Tassie distillery: Nant. This one was smuggled along by the rather late member in a small pocket sized flask, so his wife was not alerted to the bottle’s attendance. It proved to be big, well rounded, fruity and all together delicious, another feather in the cap of Tasmanian whisky. The pinnacle of excitement of the night was the opening of one of the more peculiar bottles in our collections – a blend of Islay malts, featuring a large-nosed pirate on the label. It was of course, Big Peat, and the bottle we finished the night with, expecting an intense smokiness unlike anything we’d tried. And in some ways it did deliver. 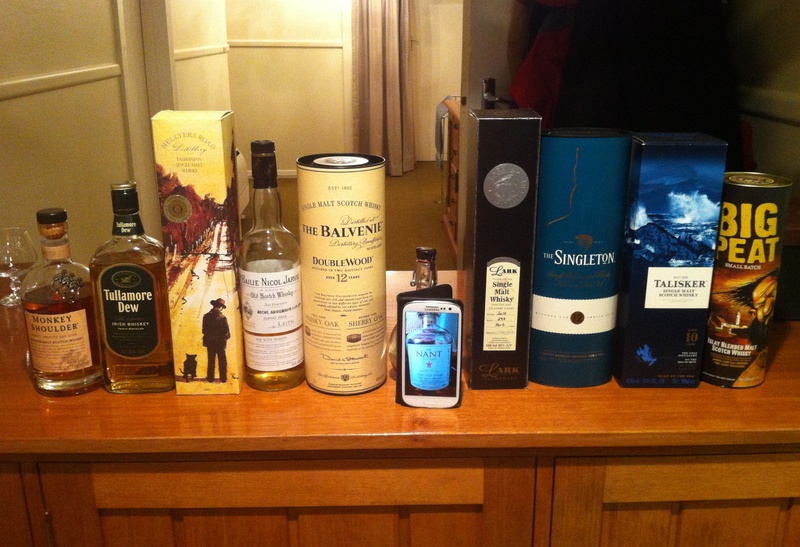 But the bottle was such a one trick pony (peat and… not much else) that we were a little disappointed. The real winner of the night was the dram we preceded the Big Peat with. This was the Talisker 10 Year Old and we all agreed it to be a fantastic drop. It certainly is one of the more impressive 10 Year Old malts going around, and perhaps only rivals a certain two Islay 10 Year Olds for supremacy in this category. But that is a debate for another night. This one was simply concluded with a nod of appreciation to all we had tried. And then a sneaky dram of Lagavulin 16 to keep us warm as we walked home.